Bloomberg Government for iPhone and Android. Your phone is an extension of your body, which is why Bloomberg Government never leaves your side. From meeting to meeting, from bill proposals to the president’s desk, BGOV is your eyes and ears on the Hill. Navigate seamlessly through your favorite content, alerts and access all the news, events and people you need to know wherever you go. It puts all of Washington at your fingertips. Available now on the iPhone App Store and Google Play! Get the news you need, delivered how and when you need it. Create a customized feed of the news and alerts you need to stay ahead of the game when away from your desk. Know who to contact and how to reach them with mobile access to Washington’s most comprehensive directories. 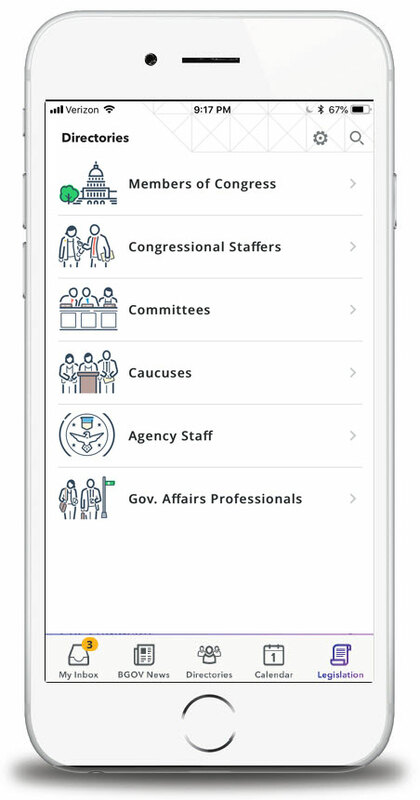 Every staffer, every player, every Member—in depth, in detail and just a screen tap away. Keep up to date on relevant upcoming events with your own personal daybook. Stay looped in on the upcoming events that matter most to you and your organization. Your BGOV browser and mobile app experiences are seamlessly synchronized, meaning any change you make on your desktop goes with you.